Meredith came to visit us last week, for a long weekend. We had a lot of fun. She, Jason and I went to a South Asian re-imagining a Midsummer Night’s Dream, acted in seven languages, including English. The costumes, set and acrobatics were beautiful. The next day, she and I went to a running store for some shoes. We’d planned to walk in the redwoods, but extremely sore knees and back I got after the first training walk put a crimp in my plans. Meredith thought I needed better shoes. That evening, M’s friends cooked an amazing home-cooked Korean meal for a group of us. Sunday, the three of us drove to Healdsburg’s antique fair, where M got a great old poster, and returned in time to eat dinner at the Slanted Door. On our last day, I showed Meredith around a few SF neighborhoods she hadn’t seen — Chestnut Street, Fillmore Street, and Clement Street, where we tried delicious peanut butter flavored egg cakes, Hong Kong style. We also stopped at Ichiban, the Japanese dollar store in Japantown, where I purchased a collection of kelly green bamboo planters, an iPod headphone winder, silicon hedgehog kitchen mats, and a yellow bird-shaped orange peeler… I’m not sure why. Perhaps my affinity for chindogus got the best of me. In a little over two 2 from now, Marcia, Susan and I will participate in the Avon Walk for Breast Cancer, as team Udder Chaos. We’ve set a team goal of raising $6,000 for breast cancer treatment and research by then. Susan and I decided to try out one of their training walks this weekend. I got up at 5:30 for the first time since 1986 — ouch. We met the group at Chrissy Field, near the Golden Gate bridge. 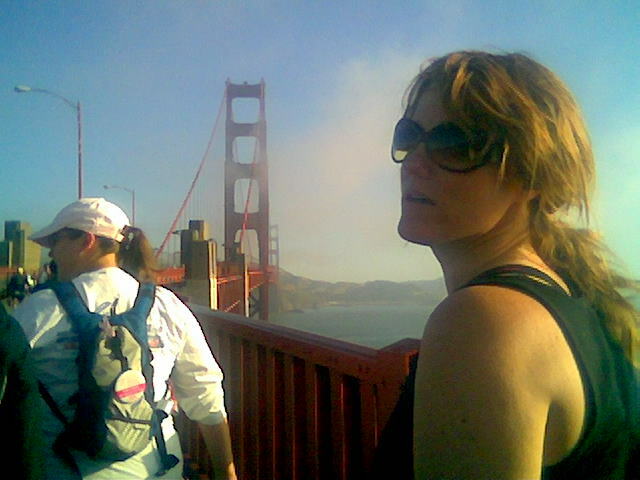 Walking over the Golden Gate was amazing — it was the first time I’d done it on foot. It was an absolutely gorgeous sunny day, with the sun shining on the water. On the other side of the bridge is Sausalito, and hilly landscape looks like the Italian riviera. There were many kinds of wildflowers blooming along the hillsides. 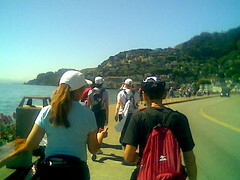 We walked to and through the commercial part of Sausalito, then back toward the bridge. There is a network of pretty foot and bike trails by the bridge we hadn’t known about. 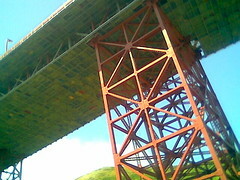 We walked under the bridge on the way back, and saw this cool and unexpected patchwork pattern. 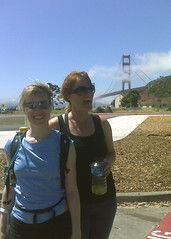 Walking 12 miles was a little strenuous, and we were definitely feeling some muscle aches, but it was a lot of fun. Apparently the group meets up almost every week; we’ll try to join them. The event was laid back and friendly, and we enjoyed talking with the other walkers. Some of them had lost close friends and family to breast cancer. It was touching to see their involvement in helping others with the disease. We were excited to be a part of it. If you’d like to help us reach our $6,000 team goal for helping those with breast cancer, please click through to my personal page, where you can easily donate online. It’s a great cause, and we would truly appreciate your donation. Victorians – Alamo Square, originally uploaded by David Paul Ohmer. Last weekend, we attended Kit and Jake’s wedding — a short and sweet ceremony at Alamo Square Park. That’s the park in the opening credits of Full House, with the painted lady Victorians and city skyline in the background. It was a gorgeous sunny day. The ceremony was punctuated by a bicyclist zooming between the officiant and the bride and groom. Butters jumped down a shaft between the bookcases, where they meet in the corner. The shaft is 1’x1’x8.5′ tall, and there was no way for her to escape on her own. I spent an hour and a half lowering down duffel bags attached to ropes, filled with cat food; screen door material cut to size; rope ladders; etc. Pathetic mewling sounds issued from the shaft. Finally, a red cat play tent (yes, I have a red cat play tent) was the thing that worked. I attached it to a rope and shot it down there. She climbed on top and I airlifted her out. 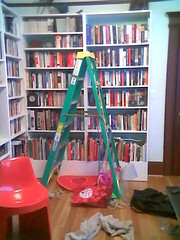 We spent part of last weekend cat-proofing the living room.